Diablo creator David Brevik is finally ready to show off what he’s been working on for two years at his indie studio Graybeard Games. It Lurks Below is a sandbox game that takes its cue from Re-Logic’s Terraria in both gameplay and style. Two hundred players will have access to its closed beta from Friday to Monday evening, and Brevik plans to livestream himself playing the game at various times this weekend on his Twitch channel. Garybead hasn’t released much about It Lurks Below. It mashes up gameplay from Terraria alongside Diablo mechanics. Screenshots feature a retro pixel art aesthetic with characters wielding guns, defending homesteads, and fighting monsters in gold-studded mines. Brevik created the iconic action role-playing game Diablo at his studio, Condor, which eventually became a part of Blizzard Entertainment and adopted the name Blizzard North. The game was hugely successful when it launched in 1996, selling over 2.5 million copies and popularizing the real-time action RPG genre. It eventually spawned two sequels — Diablo II and Diablo III, which has sold over 30 million copies in its lifetime. Since Brevik’s early days at Blizzard North, he’s founded and joined other companies including Gazillion Entertainment. He went independent in January 2016 and founded Graybeard. His story seems to follow the trend of triple-A talent taking the plunge into indie games. Graybeard is a solo effort, and Brevik says that it’s challenging but rewarding. Terraria released in 2011 for PC, though it has rolled out to iOS, Android, and a plethora of other consoles since then. It’s sold over 20 million copies and inspired other games besides It Lurks Below, such as Chucklefish’s sci-fi sandbox title Starbound. Google launched a new cloud security feature today that allows its cloud customers to set up custom access policies for different user accounts, only allowing access to particular aspects of specific services. For example, one account could be set up to only view cloud storage buckets, plus list the database tables in Google’s BigQuery service. That may not seem like much, but it’s important for only giving accounts access that they need, which can help reduce risk in a security breach. Google previously offered a large set of prebuilt security roles for different situations, but this new feature lets companies create their own. This new feature helps developers create service accounts in Google’s cloud that give automated software agents the ability to access multiple services while still retaining few privileges to access or modify what they shouldn’t be able to. Above: A Google animation shows how its custom access roles work. It’s also important for compliance purposes — regulations may require people inside a company to be able to audit particular pieces of information but not modify content, or to prevent someone’s access to that information depending on their role. Google Cloud is focused on making its offerings appeal more to enterprise customers, in a move to compete with Amazon Web Services, Microsoft Azure, and other players in the market. These sorts of finer-grained security controls, while not the flashiest announcements in the world, help solve requirements that enterprise IT leaders need to have fulfilled. To help customers get started, Google published a list of supported access permissions for its cloud services, as well as a set of best practices for getting started with custom roles. These capabilities are available free of charge, though they’re not of much use without other paid services running inside Google Cloud. It’s been decided: on Sunday, February 4, we’ll witness the New England Patriots and the Philadelphia Eagles battle it out at Super Bowl LII. Under the dome of the U.S. Bank Stadium in Minneapolis, an estimated 70K hyper-engaged fans, media, and dignitaries will be watching, snapping, and posting throughout the course of the game. Underpinning that engagement: secure, connected Wi-Fi, which isn’t just a nice-to-have any more, but essential. It’s not just a part of the fan experience but a wellspring of actionable, in-depth customer intelligence. With the amount of data passing over the network increasing exponentially, digital marketing teams are being handed the ball, and a clear field for their engagement strategies and tools. Currently 22 NFL stadiums are leveraging the ExtremeAnalytics tool from Extreme Networks, the League’s Official Wi-Fi and Wi-Fi Analytics Solutions Provider, including Baltimore’s M&T Bank Stadium, Seattle’s CenturyLink Field, New England’s Gillette Stadium, and Buffalo’s New Era Field. It all started when organizers realized that there was a correlation between television ratings and in-stadium attendance. As a result, in-stadium wireless usage has increased from one terabyte to 4 times that on game day year over year. From 2015 to 2017, the average number of unique users rose from 20,574 to 28,001, with peak concurrent user count shooting up from 14,836 to 18,650. And as fan engagement soars, attendance rates are corresponding, Rice added. But that initial focus on increasing attendance led to something arguably more valuable: unexpected insights gleaned through hundreds of thousands of usage data points. As in-stadium Wi-Fi data ramped up, marketing and experience teams gained the ability to understand which applications are running on their networks, who is using them, and what the response time is for each application. The location of users and their mobile activities can be mapped in context to other identity-specific information about the mobile user — including demographic information, brand affinities, social network information, buying behaviors and more, allowing tailored customer profiles to be updated on the fly and personalized experiences delivered seamlessly. “With this engagement, you can work with each fan, each person, and make sure that it all connects your brand to that particular person, and to what you can give them to make them more loyal, make them stickier, or reward them for being a fan.” Rice explains. And as usage grew, the club gained a whole lot of invaluable analytics, uncovering some surprises along the way, especially as more and more stadiums came on board. For instance, the demographic at Super Bowls typically skews towards an older male audience. So when asked which social network would be most popular at the Super Bowl, many might default to Facebook as their answer. But at last year’s Super Bowl, other social apps like Snapchat ruled the day. With ExtremeAnalytics, not only can NFL sponsors discover the people who are actually attending these events, they sometimes uncover unexpected platforms to reach and connect with end users in the venue. Advertisers can identify touch points like these via consumers’ profiles, what they’re doing during the event, and in what cycles, via time stamps on the data. That allows them to optimize ad placement — for instance, in the case of last year’s Super Bowl, choosing Snapchat during the fourth quarter, perhaps. And by pinpointing each ad to a specific set within a specific geography, that ad can be highly targeted, delivering the right information at the right time, right when those users will be most receptive. On a very technical or tactical level, Rice says, you can highlight or amplify certain services that you want to make available to a fan in the venue, he says. For example, using a push alert in the mobile venue app for autographed memorabilia. With one-step engagement enabled, you can prioritize that ordering and outreach service, and the content delivered to the person, over any other content that’s available in that venue – for instance, amplifying the offer by giving it higher priority to those on a particular channel, rather than somebody who’s watching something on YouTube. “Giving the Game Day app priority seems trivial or easy, but it actually creates both a completely different user experience and gives the advertiser an unprecedented advantage by capturing that fan’s attention naturally and powerfully,” Rice says. Last year, Super Bowl LI made Wi-Fi history by being one of the most connected and engaged sporting events to-date. The game leveraged both Extreme’s Wi-Fi infrastructure and Wi-Fi analytics solution, and the company reports that a record-breaking 11.8 TB of total data was transferred, up from 10.12 TB at last year’s Super Bowl — a tremendous amount of data for a single event. Super Bowl LI broke another Super Bowl Wi-Fi record, with over 27K concurrent users on Wi-Fi at peak — 41 percent more than Super Bowl 50. In total, over 35K fans were on the network throughout the game. What were they doing? Social networking, and a lot of it. 1.7TB of the total data was transferred from social networking engagements, a 55 percent increase in comparison to Super Bowl 50. “In the ’17-18 NFL season, we saw video usage through the roof — people were basically real-time filming the game and sharing it externally through social,” Rice adds. The NFL Clubs and Stadiums have made significant investments in their fan-facing Wi-Fi. Now that they can measure the operational and business metrics, they can watch trends across games and stadiums to establish benchmarks, create digital strategies that are smart and data-driven, and deliver more powerful and personalized fan experiences. That means ensuring that both the Wi-Fi platform is providing a seamless, quality experience in-stadium as well as in-depth analytics to measure that satisfaction and continue to fine-tune. It results in data that’s relevant across every department — from social, digital, and marketing, to sales and business development stakeholders — unlocking a spectrum of actionable opportunities across the stadium and throughout social platforms and the web. Which means Wi-Fi in an event space is so much more than engaging with fans during the game. Actionable data gathered in-stadium means you’re always engaging and connecting with fans, even when the next game is days away. When I wrote my first book, The Zen of Social Media Marketing (now updated and in its 4th edition), back in 2010, the idea of the connected consumer hadn't really reached maturity. We weren't as attached to our smartphones as we are now. We didn't research every purchase as closely. We didn't expect our offline and online worlds to sync up so effortlessly. Now, just 8 years later, your average consumer - the connected consumer - has changed drastically. That means that the way we market to them has to change, too. It's this monumental shift in consumer behavior that inspired me to write Momentum, which comes out in paperback on February 6. In the book, I write about the 5 principles that I've observed in my work with clients at my marketing agency, Zen Media. And when it comes to reaching the connected consumer, I think perhaps the most all-encompassing of those is the last one: cross pollination. Cross pollination is one of those terms that's been overused in the business world over the past several years, so it's worth it to go back to the original definition. In biological terms, of course, cross pollination refers to the transfer of pollen from one individual plant to another individual plant, with the result being a brand-new seed - a packet of creative material that contains the potential for a new, totally unique - and, by the way, much hardier - plant. When we talk about cross pollination in marketing, we're referring to this miraculous process: one idea meets another idea, and something wholly new and creative results. This could mean a partnership between brands to promote a cause their customers are passionate about. It could mean a partnership between an influencer and a brand to take a brand's products into a new market. It could mean blending the digital and offline worlds to create a unique educational experience, like Zen Media did with our Social Media Genius Bar at the Chase for Business conference. These sorts of new, unique, and creative experiences are what the connected consumer wants - and cross pollination is the way to deliver them. How do you incorporate cross pollination tactics into your marketing? So what will cross pollination look like for your brand? While every brand's needs and approach will be different, here are the initial steps you need to take to start expanding your creative horizons. Look outside your industry for interesting ideas and brand activations. The best place to look for an idea that nobody in your industry has thought of yet is, of course, outside your industry. Apple did this when they teamed up with Nike to create Nike+. Up until that point, a tech company partnering with a fitness shoe brand hadn't been done - in fact, it's likely that many less forward-thinking companies didn't think it would be successful. By partnering with an unexpected brand, rather than another tech company, Apple got customers' attention and gave them a unique experience - and this was before most companies were even talking about the connected consumer. Look to your existing resources and mine the possibilities. Cross pollination is all about looking at your resources through a fresh lens. What do you already have, and how can you put it into action in a new, different way? This is what we did with a client of ours at Zen Media (at the time, we were still Marketing Zen). A major apparel manufacturer wanted to create a huge splash on social media - but they didn't have the digital following to do it on their own, despite their massive traditional following. To make this social media campaign successful, we spoke with their retailers, which did have large social media followings. By partnering with these retailers and leveraging their digital presence we were able to give our client the social media event they wanted - and all while helping the retailers sell more product. Be bold in your brainstorming. A few years ago, no one would have thought you could virtually try on Sephora lipstick shades via an app, then save the ones you like to try on when you're in the store. And yet that's just one example of the many integrations between the offline and online worlds that we're seeing brands creating now. It simply doesn't make sense to think, design, or sell in silos anymore. The brands that win the loyalty of connected consumers now and in the future will be the ones who break down walls and embrace a culture of innovation. For more on cross pollination and the other principles I discuss in Momentum, check out the book on Amazon. You can also watch this video overview of the 5 Principles. In some ways, it can be easy to shop for beauty products and services. There are thousands of offerings in the marketplace, meaning that somewhere out there is the perfect product for you. But, for that same reason, the market can also be daunting -- especially when it comes to finding new looks or options. In this video, Entrepreneur Network partner Jen Hacker sits down with Katia Beauchamp of Birchbox to talk about how a company can best navigate that tricky space. Beauchamp explains that Birchbox wanted to make the idea of discovering new looks fun, not daunting. In that way, the subscription model helped Birchbox achieve its goal -- which wasn't just to create a subscription, but instead to make shopping for beauty more accessible. Related: This Entrepreneur Finally Stopped Talking About Her Idea and Started Making It Happen. Now, She Sells Cookie Dough at Her Own New York Store. As I mentioned in the first issue of this series on the CISO/security vendor relationship, almost all B2B security vendors want to reach CISOs and CSOs with their marketing efforts. Take a step back and think about the receiving end of this equation. How are CISOs and CSOs supposed to manage their business if they also have to constantly manage all the security marketers vying for their time?? They’ve got a tough enough job within the four walls of their organization without dealing with the endless barrage of intrusions from all over the world. How are they supposed to entertain pitches from EVERY SINGLE SECURITY VENDOR ON THE PLANET? ISSUE #2: Should “15 minutes of your time” be a security vendor’s first request? Recently, I had lunch with a CISO who I had previously interviewed on camera for one of my clients. We’ll call them Company X. My video interview with the CISO appeared on Company X’s blog. It just so happens that someone at Company X, who I didn’t know, was pitching the CISO a barrage of emails asking for just “15 minutes of his time.” With the continued non-response, the person just kept following up, sometimes with attempted jokes trying to poke fun at the CISO’s non-response. My CISO friend is a nice guy, but you can’t count on that to get a meeting. “They don’t have time to meet with you because they’re nice,” said Bruce Barnes (@bbarnes84), co-founder of CIO Solutions Gallery. This week, we’re doing a Tech Check with Krista Morgan, CEO of P2BInvestor. Founded in 2012, P2BInvestor is a marketplace lender that provides revolving lines of credit of up to $10 million per small- to mid-sized borrower. The company has 22 employees and is located in Denver, CO. The University of Illinois -- Chicago is home to a unique education program for entrepreneurs with disabilities run by associate professor Dr. Katherine Caldwell. It's called Chicagoland Entrepreneurship Education for People with Disabilities. Caldwell found that Chicago-area entrepreneurs with disabilities had trouble finding resources to grow their businesses, had high barriers to entry and faced structural challenges from the disability benefits system. Chicagoland Entrepreneurship Education for People with Disabilities aims to help participants understand the benefit system and other typical barriers to entrepreneurship so that they can find a way to be most successful in building a business. Like in any demographic group, there’s plenty of desire to build businesses in the disability community. Perhaps, it’s even stronger, Caldwell said, because traditional employment opportunities for people with disabilities are often less than ideal. In fact, she argues many companies are exploiting workers with disabilities through sheltered employment because it’s a way for companies to employ people who they can pay significantly less than minimum wage. In addition to entrepreneurship as an escape from sheltered work, people with disabilities can use entrepreneurship to tackle challenges they face every day navigating a mostly inaccessible world. “They can tap into that innovative potential of having experienced the problems that their business serves first hand,” Caldwell said. Caldwell believes there needs to be an increase in representation of entrepreneurs with disabilities on a wider scale. Representation matters within the disability community because it shows people what is possible. To throw in a popular adage: If you can see it you can be it. But increased representation also matters outside of the community to break stereotypes. 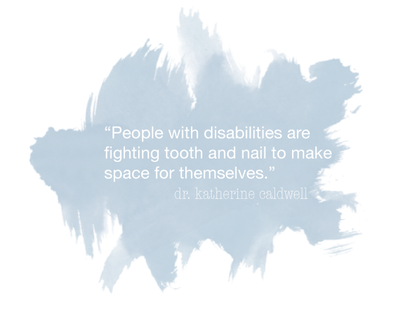 “People with disabilities are fighting tooth and nail to make space for themselves and to make themselves heard,” Caldwell said. But they still face stigma around their ability to work. One way that Caldwell sees representation as helpful is in business growth. As a result of the disability benefits system, many entrepreneurs actively work to keep their companies small. So the risk for entrepreneurs with disabilities can be high because there’s nothing to fall back on. Due, in part, to this situation, entrepreneurs are creating businesses with very minimal overhead. With increased representation, more support and help navigating the benefits system, more entrepreneurs with disabilities can bring their diverse perspectives, skills, problems and ideas into startups and begin to create a better world. 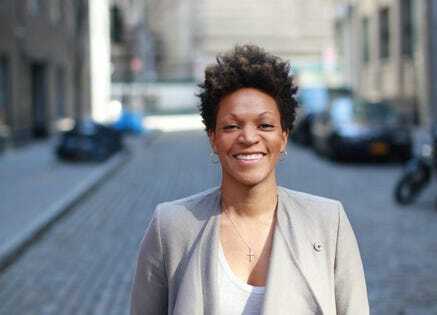 Dionna McPhatter is a 2004 West Point graduate and the cofounder of BLKBOX. The path for graduates of the prestigious United States Military Academy at West Point is pre-written: They are expected to serve five years in the U.S. Army. West Point graduate Dionna McPhatter took another path, in the volatile world of marketing. McPhatter, once an all-star member of the Army Black Knights women’s basketball team, had undergone three hip surgeries by the time she reached her West Point graduation date in 2004. She was medically discharged and accepted a job in consumer insights with Procter & Gamble. Her career quickly took off. She became vice president of marketing at Reckitt Benckiser, a multinational company that owns ubiquitous brands Lysol, Calgon and Woolite. Then, she gave it all up to start her own marketing agency, BLKBOX, with her former West Point classmate Keenan Beasley. BLKBOX launched in 2014 with a mission to disrupt the marketing landscape. Just by existing, BLKBOX is disruptive—it’s one of the only minority-owned marketing agencies in Manhattan. Marlena Hartz: Why is disrupting the marketing landscape important to you? Dionna McPhatter: I think marketing in its purest sense should actually provide value to people. That’s how I see marketing at its core, and I think we’ve lost our way. The traditional advertising world today, even with all the advances in technology, has lost this perspective. There’s a big gap in understanding, core listening and empathy in the marketing and advertising world. Hartz: Big brands have recently made major marketing missteps, producing culturally offensive ads. What stands out to you as one of the biggest missteps? McPhatter: The Pepsi debacle with Kendall Jenner. To me, it was like there was a brief—here are all the things that need to be present—but there was no context of actual people’s lives, what actually moves people and is emotionally resonating. That to me shows the kind of disruption we need to be relevant today in the world of advertising. Hartz: Conversely, what recent campaign stands out as effective? McPhatter: The Amazon commercial, where the guy orders a lion costume online. It so simply captured a life change, and the part that I would emulate is the simple insight. That’s a human truth—you go through times in life where one change changes everything. One change, the presence of a baby, literally changed everything. Bringing that to life in a way that people can relate to is actually harder than it sounds. Hartz: What should brands like Pepsi or the Kardashians do in the wake of a content scandal? McPhatter: Instead of worrying about yourself, go close to the audience that you’ve quote unquote “offended.” Don’t dig your heels in. Go to that community. If I felt like it was genuine from Kim Kardashian or Kylie, if I felt like there were people of every skin tone on their team, I wouldn’t expect it [a scandal]. One of the things that Rihanna is getting the most credit for is her lighter shades of makeup. That’s amazing to me. It’s inclusive. I’m not questioning a black person for doing lighter shades because she just exudes this inclusion. Hartz: What steps do you take at BLKBOX to ensure your content is effective? McPhatter: Being out in the market and not just staying in our nice offices in New York. We have a balance of perspectives and views in our office. We have every livable content represented on our team. The conversations that happen around our table are going to be more challenging, and we think that’s a good thing. We’re going to end in a result that appeals to more people because we pressure-tested more through different points of view. For me, diversity isn’t being a person who just from the outside looks very diverse. It’s diversity of thought. Being in an environment where everyone thinks just like me is also very unhealthy. You need diversity of thought so you can appeal to more people. That’s the magic. That’s why we have varying age groups, different generations, and people from the Midwest and the West Coast and outside of the U.S.
Hartz: What’s the next step for brands that want to authentically respond to social movements like #BlackLivesMatter or #MeToo? McPhatter: There is a more salient awareness of our bias, which I think is a great thing. I hope that it has a lasting impact, and it changes our behavior, resulting in actions that are truly more inclusive and less biased. That’s what I’m hopeful for. I’m a little bit cynical. Ultimately, it’s about where people invest their time and money—that’s what will show us if there will be transformational action. Are we dealing with the wage gap? Are we investing more in women and in diverse groups of people? Is it easier for them to get a loan? Is there more representation in advertising and campaigns, and not just on a cool lifestyle yoga campaign but an everyday brand of yore? I want to see more brands acting like a Cheerios, doubling down on their commitment when some of the prejudice bubbles up because inherently that’s going to happen. January, the month of great determination and resolve to change, is coming to a close. While a new year is an opportune time for small business owners to evaluate the prior year, visualize a new direction for the business and set goals for success, a study shows that 80 percent of resolutions fail by the second week of February. “I am launching a monthly subscription option in February, so the goal is to really focus on growing that, which involves a lot of email marketing. So really the goal is to grow my email list/ subscribers,” shares Sanah Sadaruddin, founder of Grilled Cheese PR. “We have goals to wholesale our product, to spread brand awareness, and position ourselves for franchising. We are currently seeking a 15K grant or loan that would help us in launching our wholesale program,” shares Lisa Schulte, owner of Quarks American Bento. Among the small business owners I invited to share their goals for 2018, a common theme emerged: obtaining the right financing to grow. Working capital is a crucial factor for the overall health of a business; it allows business owners to cover routine payments in daily operations and create liquidity to propel their business forward. Running a small business is no small feat, and when it comes to taking your business to the next level this year—whether that means hiring more employees, growing your marketing efforts or building financial stability—applying for a small business loan can give you the working capital you need to kick off 2018 on a healthy financial note.